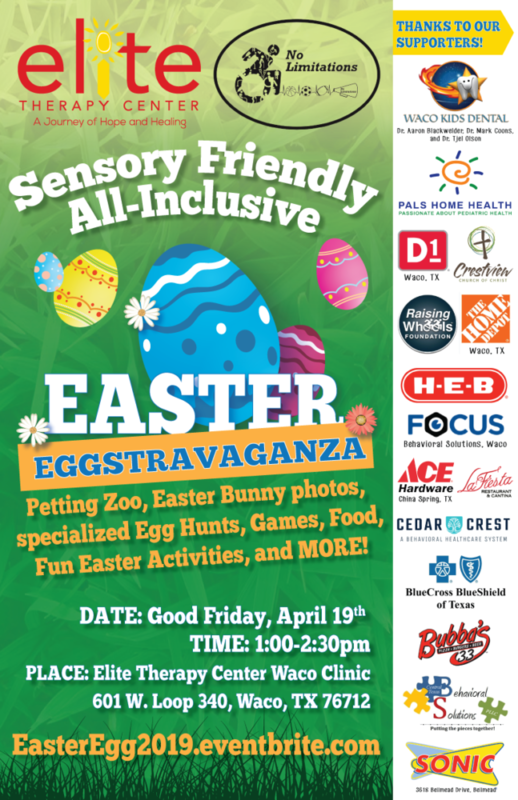 Elite Therapy Center & No Limitations are hosting an Easter Egg Hunt Eggstravaganza on Good Friday, April 19 from 1:00-2:30pm. We will have specialized Easter Egg Hunts, photos with the Easter Bunny, a petting zoo, food, fellowship and fun for special needs families. The event will focus on children with special needs, but siblings under the age of 12 are also welcome to participate. It is important that each child planning to participate be registered to ensure enough food, games, and eggs to hunt! We are in need of volunteers and ask they register here and plan to arrive early (on site) to help hide eggs and attend a brief training with event organizers. If anyone would like to donate pre-filled eggs, unfilled eggs, bags of candy, or small toys to fill eggs, items may be dropped off at Elite Therapy Center,Waco Clinic, 601 West Loop 340, Waco, TX 76712.